Amazing! This is the theme for the first month of the Australian National Year of Reading. 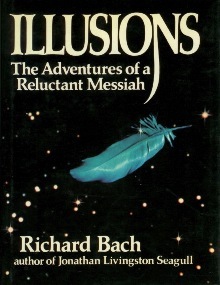 And so to kick off my involvement I will proclaim that The Most Amazing Book I Have Ever Read is “Illusions: the Adventures of a Reluctant Messiah” by Richard Bach. It is a precious jewel of a book offering a gentle and positive slant on life. I love the mystical spiritual elements that are grounded in the real world of squashed insects on windscreens and greasy hands. We are gently urged to look beyond the veil of reality where something amazing might be revealed. It is a story about two pilots who fly small planes around the USA selling rides in small town America. They meet and discuss Life. Don is the Teacher and the Richard is the Seeker. The book is revealed: Messiah’s Handbook: Reminders for the Advanced Soul; a source of wise and interesting sayings. I tend not to keep hold of many books once I’ve read them, but Illusions is the exception that I will keep and reread. I used to loan it to others but it never came back, so now I keep my own copy. And who can blame anyone for wanting to keep a copy for themselves. It sits alongside Zen and the Art of Motorcycle Maintenance by Robert M. Pirsig in a genre all of their own. Whilst Zen is complex, Illusions is a simple tale. Both gently coerce you into a deeper insight.